When Napalm Death’s unique gig at the V&A Museum in London was cancelled back in March, it seemed like safety concerns, justified or not, had done away with the possibility of something woefully rare in modern music – a genuinely groundbreaking event. Whatever one’s view of Napalm Death and their distinctive brand of guttural thrash metal, this particular gig had something special about it and the fact that the hallowed V&A had even considered hosting them in the first place speaks volumes about the nature of the project. The band were due to play at the museum in a fascinating collaboration with ceramic artist Keith Harrison, who has designed a custom built ceramic sound system which would disintegrate throughout the performance before exploding. Part live gig, part art installation, part theatre and part scientific experiment, there was huge excitement surrounding the idea when a safety inspection decided that that gallery itself risked collapse if band were indeed to go ahead and play. A testament most metal bands would kill for. However the news has broken that the performance is to go ahead after all, The surroundings may be a touch less grand – Bexhill rather than South Kensington, but Keith Harrison and Napalm Death will indeed be coming together to blow a sound system apart at the De La Warr Pavillion in Bexhill on November 29. 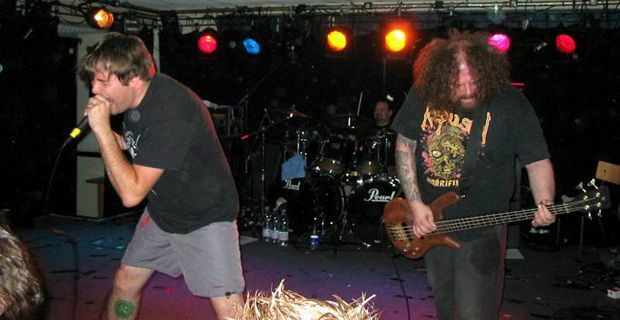 Speaking about the rearranged event, artist Keith Harrison said: "Napalm Death was my band of choice – they really understood the project. We needed a group with a lot of attitude to show the power of sound, and the energy that it has to destroy. It’s interesting to see how electrical power can change material, like clay. It can warm it up, break it down or completely change its state. One thing is for sure – the gig will be both visually and aurally entertaining." Napalm Death frontman Mark "Barney" Greenway, added: "Sound as a weapon - or a weapon of change - is a very interesting concept and I think that the whole process of our sound gradually degrading clay sculptures is captivating."